Your whole family, including your pets, are welcome at our portrait studios. We offer a "no appointment necessary"* service at over 200 locations and our photoshoot prices start at just £5.99 for a 10 picture package. 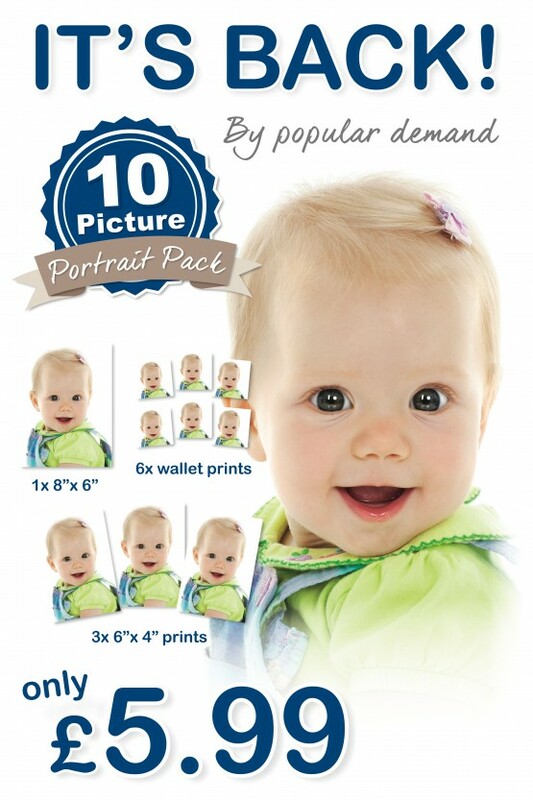 With our great package offers, you can get a studio portrait photo shoot and have your favourite photos printed on our range of personalised gifts, while you wait! *Please note booking may be necessary during Christmas peak times. We pride ourselves on delivering the best possible studio photo shoot experience for you. We won’t rush. We will go at your pace to make everyone involved feel comfortable as we know that gets the best photos! We provide a friendly studio portrait photography service with prints at affordable prices for the whole family. So affordable that you could make a regular visit to your Max Photo Centre and record your baby or children growing up over the coming years! Your photographer will take multiple photos to create a portfolio of poses featuring a variety of expressions, close-ups and props and immediately after your photo shoot session, you will be able to review your poses and choose your favourites. Photo prints start from just £5.99 including your free photo shoot and you can use the images taken to order a variety of prints, enlargements, posterprints and photo gifts. Most of our shops offer a great environment for photography of your pet during their photoshoot. * £5.99 offer applies to one full-body or head and shoulders image on our studio white background, a maximum of 3 people can be included with the £5.99 offer, any higher numbers may be required to purchase one of our packs or purchase an image on its own.